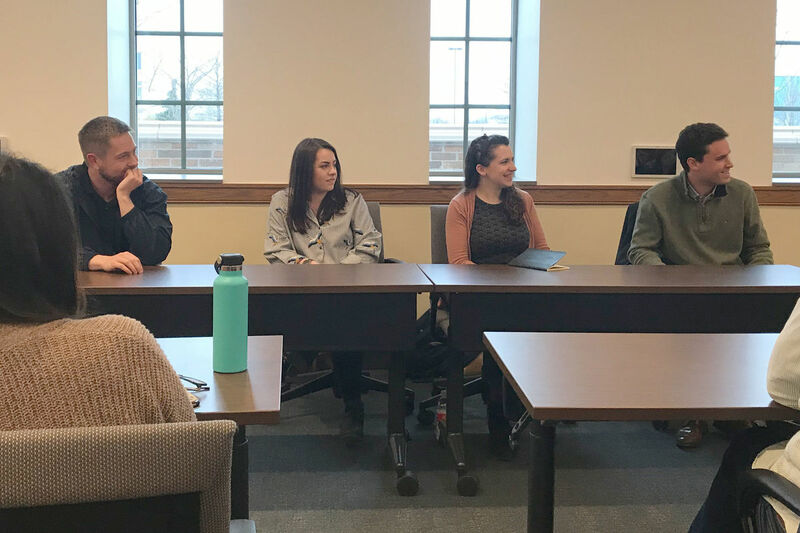 International economics alumni Rob O’Brien ’17, Bridget Pruzin ’17, Elisabeth O’Toole ’15, and Stephen Schroeder ’15 answered questions from current students at a panel discussion at Jenkins Nanovic Halls. Four alumni of Notre Dame’s international economics program returned to campus in March to speak to current students about their experience with the major, valuable classes they took, and the skills they developed that are now paying dividends in the real world. “During college, a key competency is answering a question without any sources provided. A lot of times in my job, I have to answer, within a paragraph, a question that nobody knows about on my team. I think economics is the closest within academic style of writing to this intelligence writing. It’s right to the point, and you back it up down the line. So writing has really helped, especially the econ-style writing, during my time at Booz Allen. “I took two political economy classes that I thought were amazing. One was an introductory lecture, and another one was Political Economy of Development, where we jumped geographically and functionally from different fields and subfields of political economy. It was hard sometimes understanding the papers themselves, but our discussions were really awesome. “I did a lot of experiential learning through the international economics major. I got to study abroad in Toledo, Spain, for a semester, and I went to Guatemala for a summer to do research. I developed a lot of skills through humanities-focused research. “I write most of my days, so taking Spanish classes and writing rigorous papers in Spanish really made me a better English writer. That definitely prepared me for the role that I’m in. That, combined with the hard skills of using Stata software and just general theory from econometrics and different research-based classes, definitely helps me with my current role. Financial crimes compliance analyst, Western Union Business Solutions, Washington, D.C.
“When I came to Notre Dame, I really wanted to go down the policy, international relations, and possibly legal roads. Then I started missing quantitative experience and knowledge. I also started Arabic and became interested in the Middle East, so I wanted to have an area of focus on the Middle East. International economics was a great way to combine policy, quantitative skills, and an area of study with my language. “My senior thesis was the best decision I made. The project I did was on terrorist funding and digital currency and the risk and regulations associated with that. That project is definitely what got me the job I have now at Western Union. “The international economics major helped me gain a stronger technical base to develop and interpret financial models, a broader understanding of how the U.S. economy functions, and a greater appreciation for international business as a whole. Originally published by Teagan Dillon at al.nd.edu on April 04, 2018.